Helispot maintenance day, 1976. My first experience flying in helicopters was scary, but thrilling! Once I got used to it, I loved flying. Northern California. 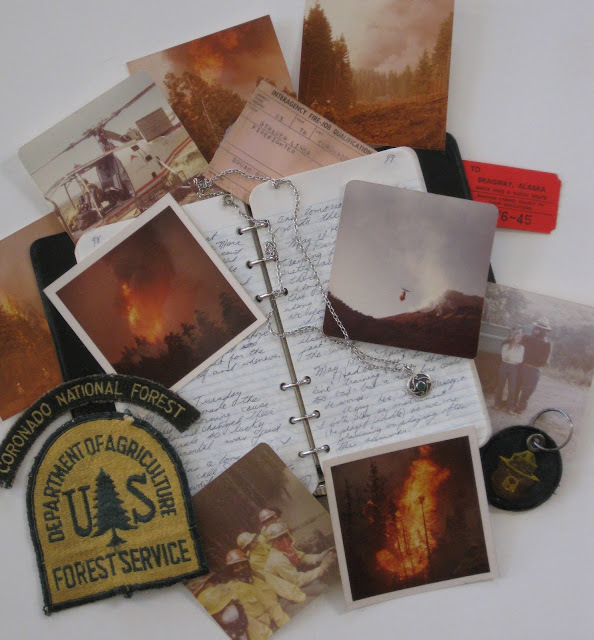 Klamath National Forest, Hog-Fong Fire 1977. At over 50,000 acres (considered huge back then) this would be the largest fire I would fight. I'd be out there for nearly 3 weeks, losing track of time, working until I was a walking zombie, and would have a pretty darned scary close-call one night. My "Red Card." Firefighters receive these to prove they passed the fitness test in order to be able to work on the fireline. A backfire on the Hog-Fong Fire on the Klamath National Forest, 1977. Here, we are setting fire to fight fire by burning out the fuel ahead of the main blaze. Rather terrifying, I must say. The ticket stub for my train ride on the Whitehorse Narrow Gauge Railroad from Whitehorse, Canada, to Skayway, Alaska in September 1980. Sadly, half of this route closed the year after I took this ride. Such a shame. A C-47 aircraft drops slurry on the Box Fire, 1976. This is my second fire, and it just so happens I was underneath that drop--a very dangerous place to be. So how did I get this shot? The photo was not taken by me, but by another firefighter who found my camera in our truck, and took photos for me. Imagine the surprise when I developed them and found these! Me and Smokey the Bear, October 1976. It was my last day at Florida Ranger Station, and the guys were getting ready for the Green Valley Parade. If I look a bit uncomfortable, it's because the guy inside the bear suit is someone I did not get along with, whom in fact I rather despised. He was mean to me, degrading, and told me to my face a couple weeks earlier that I didn't belong there, and that I should quit. My Smokey the Bear key chain. The Hog-Fong fire in Northern California. A night shot, which adds to the drama. Part of my crew riding in the back of Army transport trucks to fight the Hog-Fong Fire. The dust was so bad we covered our faces with bandanas. I finally closed my eyes because of the dust, too. I worked for the Coronado National Forest for 3 summers, and wore this patch on my fire shirts. The other two photos are also of the Hog-Fong fire. In the center: My 1976 journal, open to my first week at Florida Ranger Station. My Hopi necklace, which I wore every day and still wear often. It was purchased on our first trip out West. A friend told me the center stone represents the Earth, and the swirls of silver, the Universe. Parade Magazine featured my book today! My interview on KGUN 9 News!